Vector Eclipse H328. Photo source: Hemisphere GNSS. 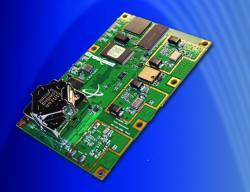 Hemisphere GNSS announces the Vector Eclipse H328, the next offering in a line of new and refreshed, low-power, high-precision, positioning and heading OEM (original equipment manufacturer) boards. 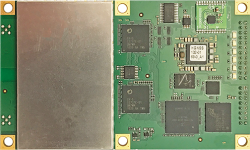 The multi-frequency, multi-GNSS H328 is an all signals receiver board that includes Hemisphere’s new hardware platform and integrates Atlas GNSS Global Correction Service. Designed with this new hardware platform, the overall cost, size, weight (44 grams), and power consumption of the H328 are reduced, according to the company, which showcased the Vector Eclipse H328 at AUVSI XPONENTIAL 2017 in Dallas, Texas from May 8-11. It offers true scalability with centimeter-level accuracy in either single frequency mode or full performance multi-frequency, multi-GNSS, Atlas-capable mode that supports fast RTK initialization times over long distances. The H328 is designed to offer fast accuracy heading of better than 0.17 degrees at 0.5 meters antenna separation and aiding gyroscope and tilt sensors for temporary GNSS outages. The 60 millimeter x 100 millimeter module with 24-pin and 16-pin headers is a dropin upgrade for existing designs using this form factor. The latest technology platform enables simultaneous tracking of all satellite signals including GPS, GLONASS P-code, BeiDou, Galileo, and QZSS making it robust and reliable. The updated power management system is said to efficiently govern the processor, memory, and ASIC making it ideal for multiple integration applications. The H328 offers flexible and reliable connectivity by supporting Serial, USB (On-The-Go with future firmware upgrade), CAN, Ethernet, and SPI for ease-of-use and integration. Optional output rates of up to 50 hertz are also supported. Powered by the Athena GNSS engine, the H328 provides centimeter-level RTK. Athena’s performance with long baselines, in open-sky environments, under heavy canopy, and in geographic locations experiencing significant scintillation is tested and proven, according to the company. Together with SureFix, Hemisphere’s advanced processor, the H328 delivers high-fidelity RTK information that results in guaranteed precision with reliability. Integrated L-band adds support for Atlas GNSS global corrections for meter to sub decimeter level accuracy while Tracer technology helps maintain position during correction signal outages. The H328 also uses Hemisphere’s aRTK technology, powered by Atlas. This feature allows the H328 to operate with RTK accuracies when RTK corrections fail. If the H328 is Atlas-subscribed, it will continue to operate at the subscribed service level until RTK is restored, Hemisphere GNSS states. The H328 is well suited for robotics, autonomous vehicles, antenna pointing, marine survey, machine control, and any application where high-accuracy positioning and heading is required.